On 16th October the storm Ophelia hit the west coast of Ireland and Scotland but in Eastern England it was not too severe. The sky was orange for a few hours and the sun dark red because of the dust and sand carried by the storm. Once the storm subsided the sky became clear for the evening and for the rest of the night. On the morning of the 17th the Moon, Venus and Mars formed a line on the eastern horizon before sunrise. My wife took the photo below with her Canon Powershot at around 06:20. 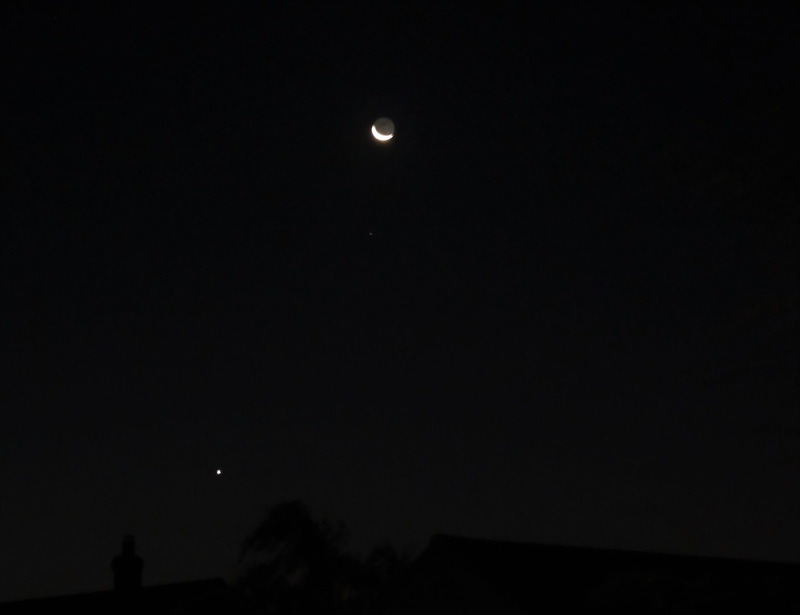 Mars is the dim spot of light just below the Moon and Venus is the bright spot lower down. This was simply too good an opportunity to miss to try imaging Mars with my Tudor Telescope. However, the result whilst showing the red colour of Mars shows very little detail of the planet. So in the earth, to this day is not known"
"You go so much backward when you fight". Shakespeare was well aware of the unexplained motion of Mars and so were his audiences. The Ptolemaic model of the Universe with Earth at the centre had the planets orbiting around the Earth in circular orbits. Everything had to be harmonious and symmetrical. Mars is retrograde 72 days in a 780 day period. To try to explain this observed behaviour with the Ptolemaic system astronomers invoked the idea of epicycles and even sub-epicycles within epicycles but, however much they tried, they could not explain the motion of Mars. Copernicus (1473 to 1543) with his heliocentric model of the solar system could explain the retrograde motion of Mars easily but it took many years for his theory to be widely accepted. In Tudor London an early supporter and advocate of Copernican theory was Thomas Digges. I doubt that even if Thomas Digges had pointed his telescope towards Mars he would have seen much more than I did earlier today but it is highly likely that Shakespeare would have been aware of his support for the Copernican theory. Digges published an English translation of the Copernicus theory in a new edition of "A Prognostication Everlasting of Right Good Effect" and a line in one of Shakespeare's plays seems to have been inspired by this.